After his record-setting Belmont Stakes triumph, there was no more famous athlete in the world than Secretariat — man, beast, or machine. The Big Red Horse had not only won the American Triple Crown in spectacular fashion, but he had also captured the imagination and admiration of people everywhere. Secretariat had become the first horse in a quarter-century going back to Citation in 1948 to win the Kentucky Derby, Preakness and Belmont. Along the way, a whirlwind of interest had built to a tornado of adulation. Now, racetracks all across the country sent along bids for Secretariat to race at their tracks. Owner Penny Chenery and trainer Lucien Laurin pondered the offers, and mapped out a plan. They, too, wished to take Secretariat to his fans. The horse had raced primarily in the East, mostly in New York. Time was limited. By the terms of his syndication, Secretariat would head off to a new job as a stallion the following season, so there were but a few months, and a few race dates, left in 1973 to wind up the horse’s racing career. Just three horses were entered to face Secretariat in the $125,000 Arlington Invitational on June 30. 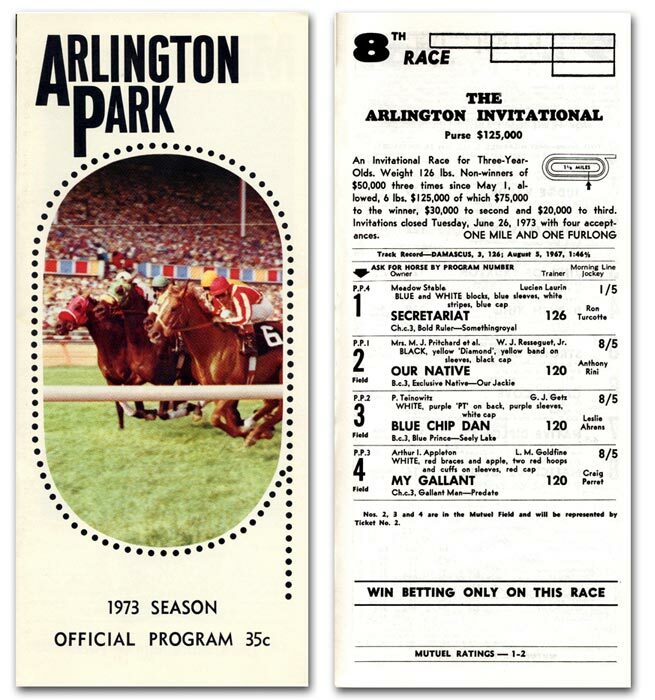 But the small field drew a huge crowd of 41,223 fans to Arlington Park, the sprawling track on the Illinois prairie in the northwest Chicago suburbs. The challengers included My Gallant and Our Native, who had battled Secretariat in the Triple Crown, and outsider Blue Chip Dan. But it was all Secretariat that day in the Arlington Invitational. “Secretariat broke a bit slowly from the outside, but went three wide into the clubhouse turn to gain command while under tight restraint,” noted the Chart Caller for the Daily Racing Form. “Secretariat moved inside once clear of rivals in mid-turn and continued under a hold down the backstretch. In other words, Secretariat won like a champ. His final margin of victory was nine lengths over My Gallant, who shaded Our Native for second. Clocked in 1:47 flat, Secretariat was just 1/5 of a second off Damascus’ track record. 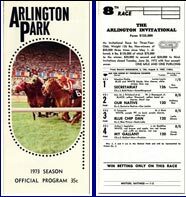 With Secretariat sure to be an overwhelming favorite, the track set up an unusual betting format for the Arlington Invitational. There was win-betting only, with just two choices in the betting. Secretariat was established as one betting entry, with the other three horses “coupled” as a second wagering entry. Fans could either bet ON Secretariat, or against him. One horse versus three. The crowd poured their money in on their favorite, and Secretariat was sent away at odds of five cents on the dollar, with a bet on the other three going off at 5-1.